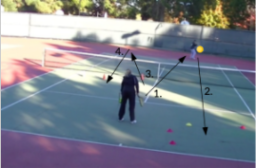 The coach feeds an easy ball to the deuce side and the player hits offensive approach shot to the deuce side and comes to the net. 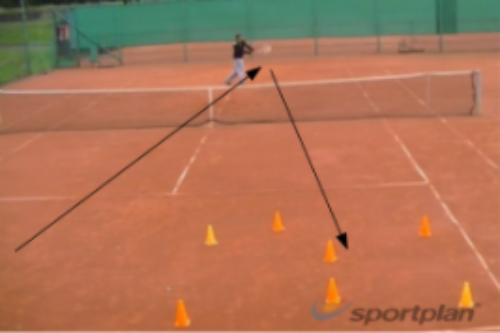 The coach feeds the ball to the backhand side and the player then finishes with backhand volley to the deuce side. The player repeats this pattern from middle of the court and from the ad side. Putting pressure on the opponent is the strategy that works at all levels. Many players mistakenly think that most of the balls have to be won with straight winners but the reality is that forced errors is the biggest group of won points in all matches. Being able to play offensively with good consistency are steps that will let players develop modern style of play that works both against right-handers and left-handers. In this drill, the player works on being comfortable by hitting offensive approach shots and finishing with the volley. Direction of the shots is not random because most of the players have weaker backhands than forehands so while playing against left-handed rivals we should look for opportunities to put pressure on backhand. 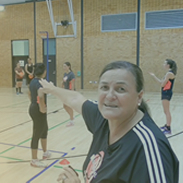 The coach should tell players to follow to the net as quick as possible because lack of quick movement can result in easy passing shot even by immediate opponent. The coach can make this drill competitive and give points by hitting the cones and the player with the biggest amount of points can give penalty to one of the peers. By giving this decision to make for the winner, players get really involved and the motivation level is really high.